Identification: One short tail on the hindwing. Upperside brown; male with long oval dark spot on leading edge of forewing. Below, postmedian line of forewing is irregular; that of hindwing is faint. Hindwing with submarginal black spot above tail. Life history: Eggs are laid singly on flower buds of host plant; caterpillars eat flowers and developing seedpods. Chrysalids hibernate in loose cocoons in litter beneath the plant. Flight: One flight from March-April in the south, May-June in the north. Caterpillar hosts: Members of the pea family (Fabaceae): wild indigo (Baptisia tinctoria) and lupine (Lupinus perennis); occasionally blue false indigo (B. australis) and rattlebox (Crotalaria sagittalis). 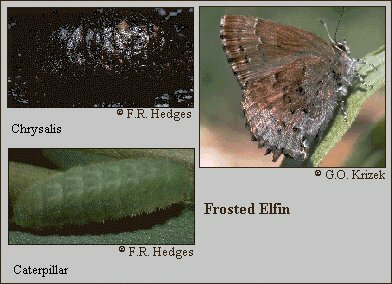 Habitat: Open woods and forest edges, fields, scrub. Range: Occurs in local colonies from Maine west across New York and southern Michigan to central Wisconsin; south along Atlantic coast and Appalachians to northern Alabama and Georgia. Isolated colony in eastern Texas, northwest Louisiana, and southwest Arkansas. Conservation: Populations are often small and local. Callophrys irus hadros of east Texas is particularly limited. Management needs: Maintain habitat by controlled burns or other physical means.